In this photoshop tutorial you can learn how to create a lipstick in a variety of colors keep them looking real. we will use several solid color adjustment layers with different shades of red or any color of your choice. 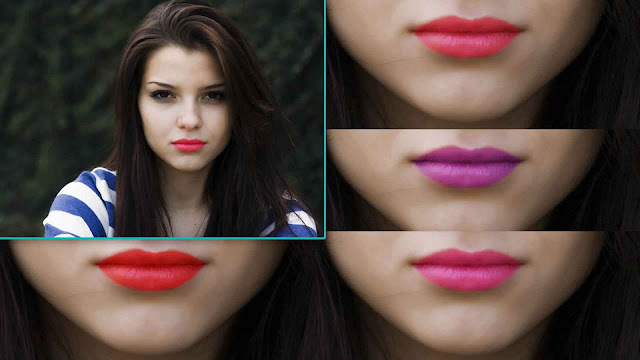 Create Luscious Lipstick Using a Secret Combination of Blend Modes and Different Shades of Color in Photoshop. Understanding the fundamental concepts of how "Screen" and "Multiply" blend mode works, we will work on the highlights and the shadows of the lips separately and apply different shades. In this tutorial, we will use several solid color adjustment layers with different shades of red (or any color of your choice) with various blend modes and mask it to the lips in different areas accordingly to mimic the properties of a lipstick and reproduce its depth and shine. I hope this tutorial helps you. Thank you so much for watching!